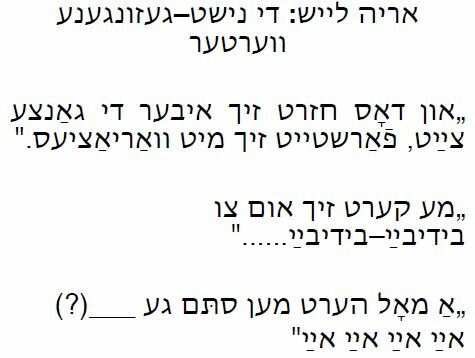 This week for the first time we present a nigun with no words instead of a Yiddish song. The nigun and the custom connected to it was learned from the singer and writer Arye-Leibush Laish (אריה ליש, also spelled “Arie Leibisch Laisch”) and became the basis for the annual backwards march tradition at Klezkanada on the eve of the sabbath. Laish was born in 1929 in Stanisesti, in the Bacau district of Romania, and attended kheyder and talmud toyre. During the Second World War he worked in hard labor camp for the Germans. After the war he acted in the Romanian Yiddish theater before immigrating to Israel in 1963. He has written several autobiographical works in Hebrew as well as plays and scenes in Yiddish. He recorded an album of the songs of Zelig Barditchver (“Freyen zikh iz gut”), and has been featured in documentaries on Yiddish culture, including one on Itzik Manger directed by Radu Gabrea “Itzik Manger” 2005). He lives in Bnei-Brak, Israel. The Jews of the shtetl would gather at the river where the Friday night sun was setting and the Sabbath would arrive. Walking backwards so as not to dishonor the Sabbath, the entire community accompanied by two or three local Jewish musicians sang and played this nigun until they reached the shul where they left the instruments, and began the Sabbath prayers. Since then, Arye Laish’s Staniseti nigun and backwards march have been integrated into the Klezkanada program by the entire community. This entry was posted on September 22, 2014 at 12:00 pm and is filed under Main Collection with tags Arye-Leibush Laish, Bacau, backwards, Bnei Brak, custom, Frank London, Israel, Itzik Gottesman, Itzik Manger, Jenny Romaine, Klezkanada, march, Nign, Nigun, Radu Gabrea, Romania, sabbath, shabbos, shabes, shtetl, Stanisesti, Zelig Barditchever. You can follow any responses to this entry through the RSS 2.0 feed. You can leave a response, or trackback from your own site. Itzik was nice enough to share this with me a while back. It’s interesting to note how quick the tempo is on the field recording. And the other sections are great! In Ruth Rubin’s collection of field recordings I see that in tape 120 she recorded Simele and Arye Schneider in Tel-Aviv, 1965. They sing a song about Yas/Jassy – Oyf der royter brik in Yas. This is Arye Laish and his wife Simele Schneider.